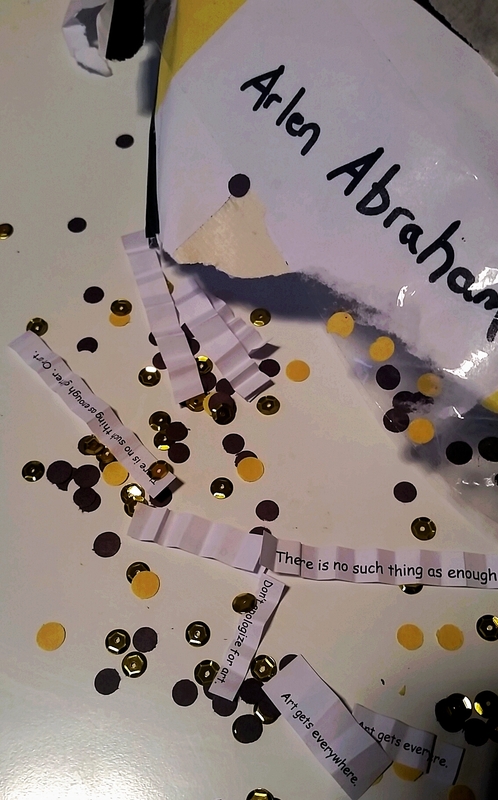 Glitter bombing has been done before – but not well. Anyone can fill an envelope full of craft glitter and mail it to their frenemies. Where is the critical engagement with the medium? The commentary on the shimmer abjectness of late stage American capitalism as it relates to the art market? THE CONCEPTUAL RIGOR? So here at Everyhere Logistics we decided to do right by glitter and combine it with confetti, tinsel, and shredded art manifestos as a statement on… Well, we’ll get back to you on that one. But whatever it is we’re trying to say – it’s really, really shiny! The results of our Glitter Manifesto Prototyping Sessions has been very informative. *100% of human rights activists considered this an act of “ARTthoritarian glitter terrorism”. *100% of engineers had to be physically prevented from rolling around in the glitter. *20% of dreadlocks were adversely impacted by exposure to glitter. *50% of Ardent Heavy Industries t-shirts had to undergo repeat launderings to remove glitter. *100% of Everyhere Logistics members reported finding this “hilarious” and/or “a total win”. Is the purest expression of your love an envelope full of sparkly, tinsel art nonsense? Then consider this Kickstarter reward a present from Everyhere Logistics to the twinkly art star in your life. If you can’t make it good, make it big. And if you can’t make it red, just add glitter.